Which version of the Christmas song I Heard the Bells on Christmas Day is your favorite? 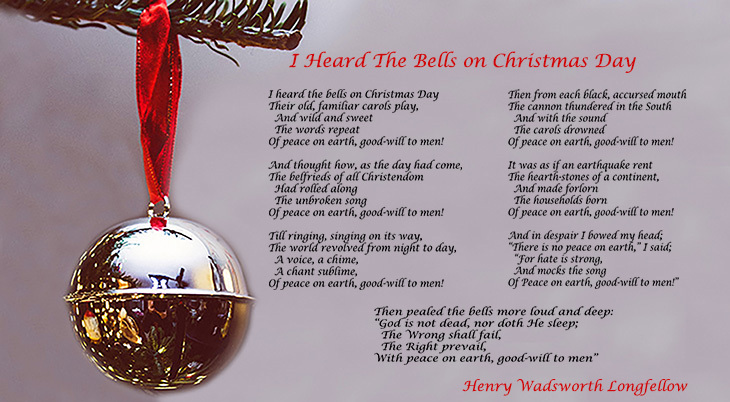 The Carpenters, Johnny Cash, Bing Crosby, Jason Castro, and other covers are shared here, as well as the story behind American poet Henry Wadsworth Longfellow's poignant and hopeful original poem Christmas Bells. When Henry Wadsworth Longfellow sat down on Christmas day 1863 to write the poem Christmas Bells, the American Civil War had reached the mid-way point and fighting raged on. Longfellow was in his 55+ years and was still mourning the loss two years earlier of his beloved second wife Frances (Fanny). Franny's dress had caught fire and Henry was burned when he'd tried to save her. He'd written The Evening Star (1845) love sonnet about Franny a few years after they were married; eighteen years after her death, his sonnet The Cross of Snow expresses his unchanging deep love and grief. That Christmas 1863 day, Henry was also worried about their oldest son Charles Appleton Longfellow (a Union soldier), who had been gravely wounded in a Civil War battle just 3 weeks earlier. 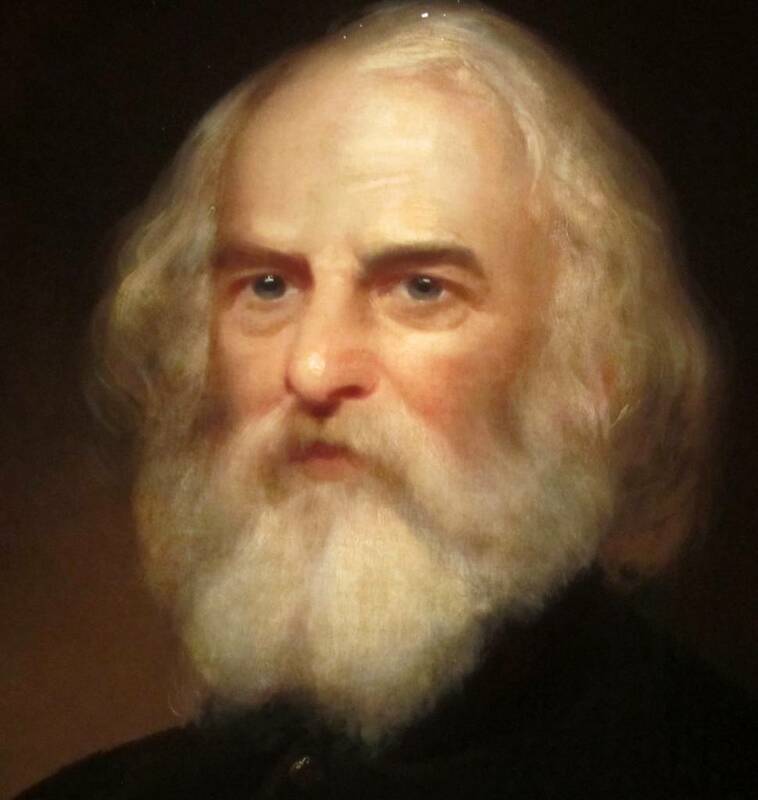 An abolitionist supporter himself, Henry Wadsworth Longfellow hoped the northern and southern states would be able to unite and reconcile their differences after the war. His powerful lyrics in Christmas Bells resonate for many people who are dealing with feelings of loss, worry, and grief during the holiday season. The refrain "Peace on earth, good-will to men" has since been used in many other Christmas songs. Henry Wadsworth Longfellow died in March 1882 at the age of 75. Longfellow's moving Christmas Bells lyrics about hope, despair, the power of right over wrong, and the triumph of peace on earth, were first set to music in 1872 by John Baptiste Calkin. Since then the song, I Heard The Bells on Christmas Day has since become a haunting holiday favourite, with numerous versions and artists to choose from. One of the earliest popular versions of I Heard The Bells on Christmas Day is by yodeling country singer Jimmie Rodgers ("The Father of Country Music"). Before Jimmie Rodgers died young at age 35 in 1933, he recorded the tune. Seniors may remember hearing Jimmie Rodgers sing I Heard The Bells on Christmas Day on the radio when it was first released. Rockapella's Christmas (2004) album also included their version of I Heard The Bells on Christmas Day. Crooner to the pre-baby boomer generation, Bing Crosby's 12 Songs of Christmas (1964) included his cover of I Heard The Bells on Christmas Day. The Carpenters version of I Heard The Bells on Christmas Day was on the album An Old Fashioned Christmas (1984), which had contained additional tracks recorded by the duo for a 1978 album. Carpenters drummer and lead singer Karen Carpenter died of anorexia nervosa complications in February 1983, a condition she'd struggled with since her teen years in high school. Her composer brother Richard Carpenter had tried to deal with his own anxiety, depression, and insomnia during the 1970s by taking prescription quaaludes - resulting in an addiction that took years out of his career before he kicked the habit in 1979. This single I Heard The Bells on Christmas Day features Karen Carpenter's amazing voice, and is a favourite with seniors, boomers, zoomers and younger generations. Frank Sinatra sings the Johnny Marks version of I Heard The Bells on Christmas Day (2004). Sarah McLachlan also sings the Johnny Marks arrangement of I Heard The Bells on Christmas Day, on her Stockings By The Fire (2007) album. Johnny Cash and wife June Carter Cash performed I Heard The Bells on Christmas Day on television in 1977, below. Cash's unique baritone voice, singing style, knowing his substance abuse history, and his loving relationship with June, are some of the elements that make this performance special. Jason Castro covers the Casting Crowns version of I Heard The Bells on Christmas Day below, in a live 2010 performance. Johnny Reid singing I Heard The Bells on Christmas Day on his second holiday album A Christmas Gift to You (2013). Note: First published in 2015; updated with new/additional content.